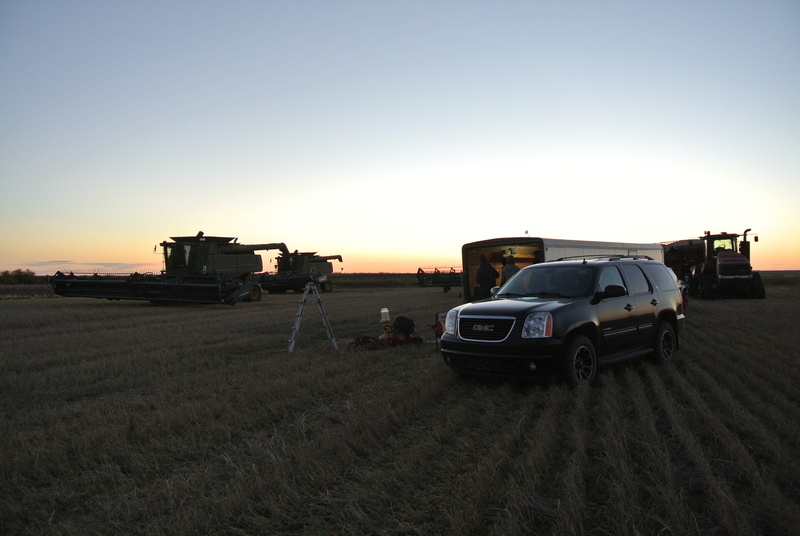 62 days, 1,200 combine engine hours and over 12,000 acres later, harvest is finally completed. It was one of the longest, most challenging harvests of my farming career, and it is a huge relief to finally have it finished. Sometimes, harvest can be a difficult time of the year to explain. How long is it? Is it always just combining, or are there other tasks to complete as well? What do you do for meals? Well, I think the best way to explain this hectic time of the year is through pictures. So, here is my first post dedicated more to pictures than to words. If you want to read a detailed description of a harvest on Leguee Farms, you can find it here. Before harvest can begin, the equipment must be prepared. 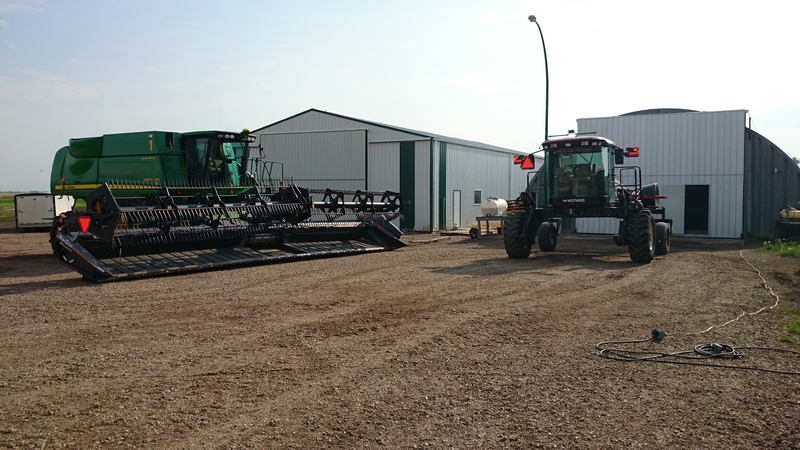 One of our combines is to the left, while our swather is to the right. Hard to believe it now, but this was back in the middle of August. Although most of the repairs and maintenance take place before and during the winter months, some work is still needed to get these machines out of storage. 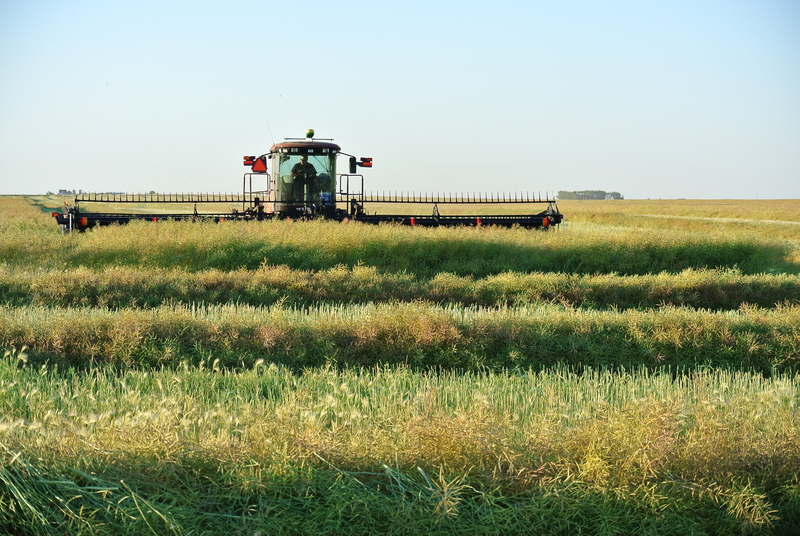 Usually one of the first activities of harvest is swathing canola. 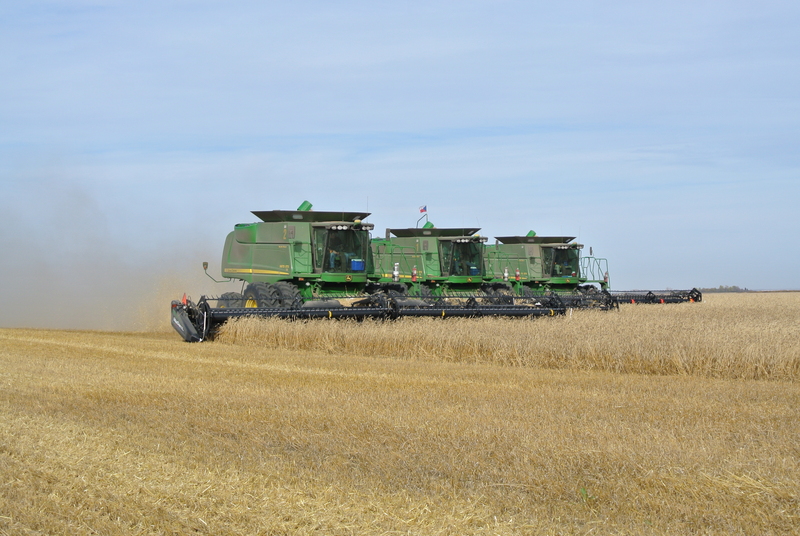 While not all farmers swath their canola anymore, we still do, and it was the first major harvest activity this year. Swathing canola kills it, allowing it to dry down for easier harvesting. The risk of not swathing canola (e.i. “straight-cutting it”) is that it is quite prone to shelling out. Next year we will try to straight-cut a field or two and see how it goes. First crop to be combined: winter wheat. The first few days of harvest are always very exciting. The view from the grain cart! These days, I rarely get to run the combine (neither do Dad or my sister Sarah), as our jobs tend to be here and there and everywhere throughout the day. Running a combine nowadays is actually pretty straightforward, with more and more automation making operating these machines much easier. 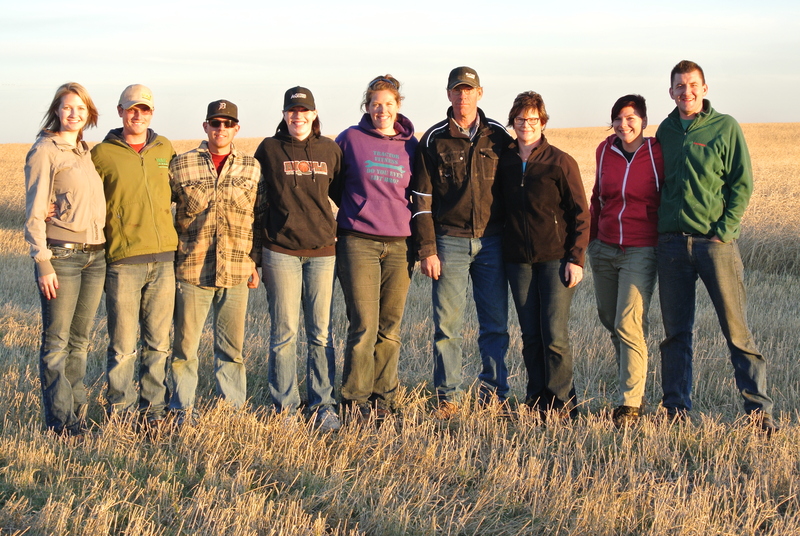 Nevertheless, there is a lot to be said for having good combine operators, and we had a great crew this year. Combing green peas. 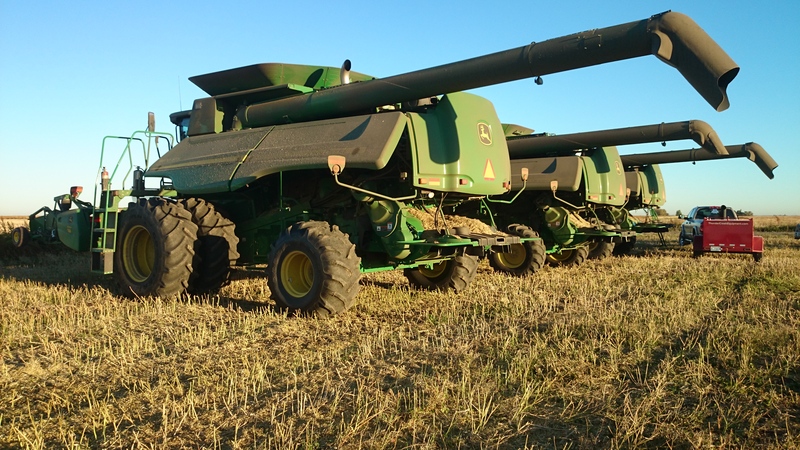 Special headers are needed for these low crops; featured here is a MacDon Flex Draper on the left, and a John Deere hydraulic flex header with an air reel on the right. After the winter wheat harvest was interrupted by yet another rain, we had to switch to peas. Since pea pods tend to shed water, you can usually get into them quicker than wheat after a rain. These peas were a particularly poor crop this year, with severe flooding ruining much of them back in June. Fortunately, there were only about 350 acres of them this year, so we wrapped them up in a little more than a day of harvesting. A lot of fuel gets burned in a day. That fuel tank, complete with a hose on a spool and a gas pump, was a new purchase for this year. Three combines burn over 500 gallons of fuel every day, plus the grain cart tractor, semis and other support equipment. With the peas finished, we were able to get back on the winter wheat. On an earlier post, I mentioned how I was sure we would get a weather break and harvest would progress better. I was wrong. It continued to be a serious fight, with substantial quality losses beginning to take their toll. 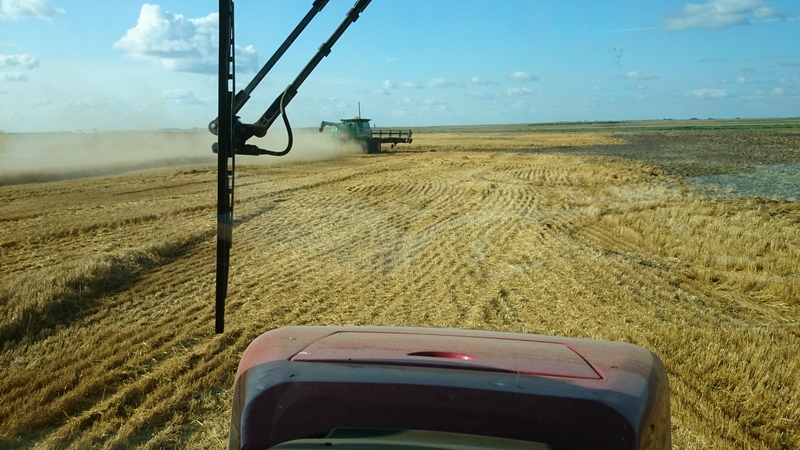 Finally, we hammered through the remaining winter wheat, and the red lentils after that. Like peas, lentils are very low to the ground, so our flex headers were needed once again. Once the lentils were finished, we could finally begin on the largest crop of them all-canola. It was important to us to get some of this crop off, as we had ambitious plans to seed close to 2,000 acres of winter wheat into canola stubble. 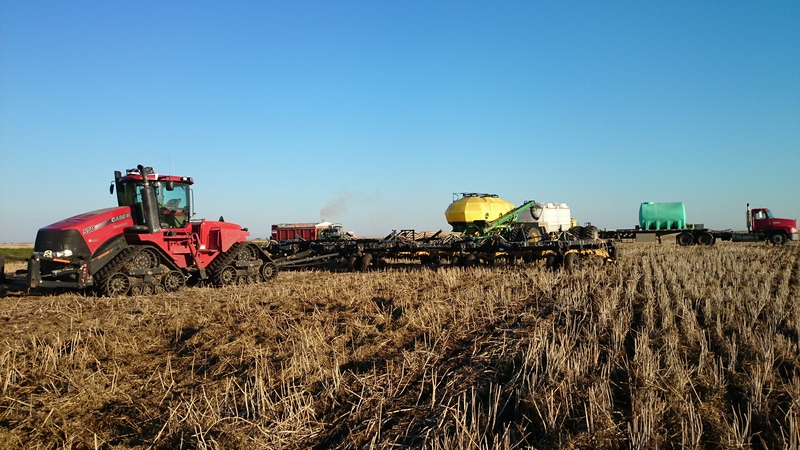 With somewhat-cooperative weather, we made some progress on the canola, easily covering 350-400 acres per day. Loading the drill is no easy task on your own. Liquid fertilizer (rear tanks), dry fertilizer and winter wheat seed must all be loaded at each fill. With the canola harvest advancing nicely, I was finally able to move to the task I like best- seeding. Seeding at harvest is a weird experience. While the harvest push is on, while everybody on the farm is working with one another, with constant radio chatter and machines going every which way, I head out to the drill alone each day, spending all day more or less alone. Sure, here and there I get some help loading and moving trucks, but seeding at harvest is very much an isolated job. It’s a great feeling though, when you get that crop of winter wheat in the ground, and you know that no matter what, seeding has started for next year. Yes, the wrong weather could kill the winter wheat, but odds are that you’ve got at least some crop established for next year. It’s a very hopeful, very exciting feeling (for more on winter wheat, check out this post). Keeping all three combines running in wheat can be a real challenge. The grain cart has it’s work cut out for it to keep up. As seeding wrapped up, harvest had progressed by leaps and bounds. We had completed most of the canola, some wheat and a good chunk of the durum while I was seeding. Once again, we were rained out, but this time the delay was fairly short. Finally, near the end of September, the weather improved, and summer arrived for a second time. We roared through the acres with near record temperatures, blasting through nearly a third of harvest in just over a week. In that week, we finished the canola and got through much of the cereals. Frustratingly, we were stopped again, and this time for quite awhile. With nearly 2 inches of rain over the next ten days, it was hard to think about how much crop was still left out there. The last push of harvest was a tough run. Short days, tough crop, and cloudy days made for difficult finishing conditions. With 3,500 acres left to go of durum, wheat, flax and soybeans, getting back into the swing of things again after such a long break was not easy. But, when faced with the prospect of mid- to late-October harvesting, one has to ignore normal harvest rules. Weather can turn at any time, and a single freak snowstorm could be devastating. Moreover, days become short, with harvesting hours becoming closer to a 9-5 job. Thanksgiving dinner in the field is a unique experience. It takes a lot of preparation! Not all of harvest is work. Almost every evening, our crew stops for supper in our tool trailer (an enclosed trailer full of tools, a welder, a torch, oil, a workbench, and so on). Sometimes it’s early, sometimes it’s late and we just eat at home, and sometimes it’s such a hectic rush to make it all work you really wonder if it’s worth the trouble. With the lateness of this year’s harvest, Thanksgiving (which, in Canada, was on the 13th of October) fell right into the thick of harvest. With a harvest this late, taking the day off is not an option, so instead we just ate out in the field! My wife and my mom brought out a fantastic turkey dinner for all of us, and a short time later, we were back on the combines! I think some of the most underrated work that gets done during harvest is the meals. It’s more important than you think to get some quality food during harvest, and my wife and mom do a wonderful job of that. The end is near! This field of soybeans was our final crop to harvest. As we pushed past the middle part of October, we were finally able to count our remaining fields on one hand. As we finished the wheat and fought our way through some tough and difficult flax, we finally arrived at the soybeans. While combining this crop does require shaving the ground, with good flex headers and well-groomed fields, they are an absolute breeze to combine. 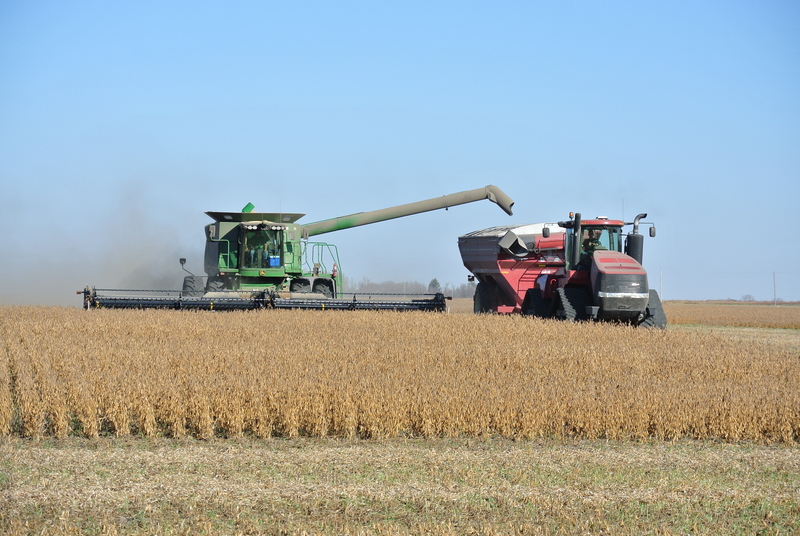 Finally, at the end of Tuesday of last week, we completed the final field of soybeans. After cleaning up some low spots of wheat and flax, the combines headed home. 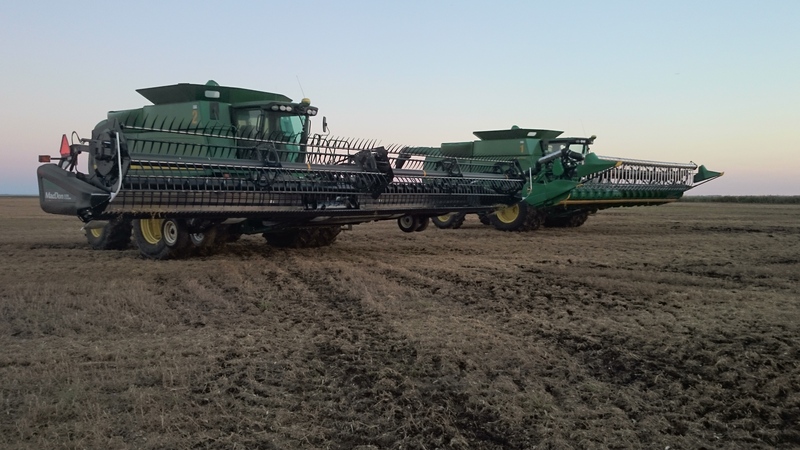 While we knew we weren’t totally finished, with a few more hours of low spots and a small field of soybeans to custom harvest, it was still a fantastic feeling. While harvest is a great time of the year, this one was very long, stressful and exhausting. 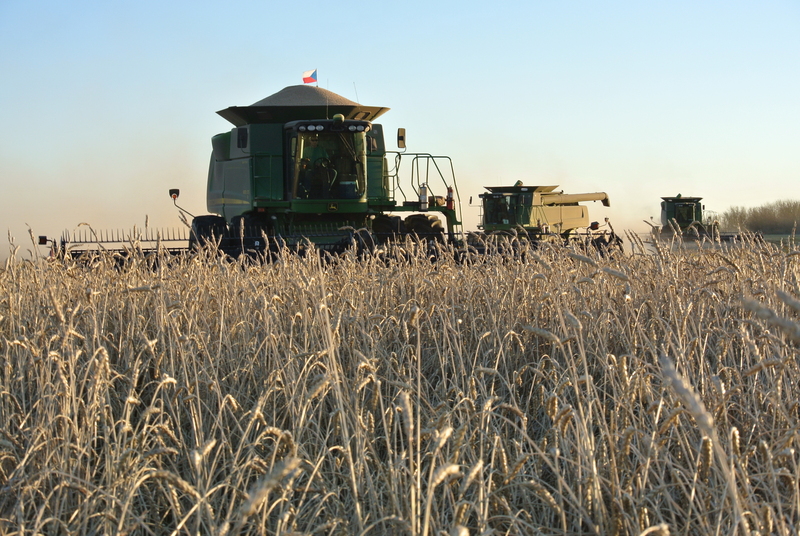 Harvesting low-quality wheat and durum added to the frustrations, and selling these crops will not be easy. But, those are problems for another day. For now, we are just happy to be finished one very long and difficult harvest. Despite all that, though, it still had its moments, and we never had a better harvest crew than we had this year. Thanks for reading. From left to right: Stephanie (my wife), Jake (me), Erik (brother-in-law), Amber (younger sister), Sarah, Dad, Mom, Dominika and Honzik (Czech Republic couple who worked for us this year; both great combine operators!) Missing from this photo are Bruce and my Uncle Don, who both are vital parts of the harvest operation. Next Article What Do Farmers Do After Harvest? Hi, Jake. I came upon your blog while doing some research on what farmers do during the year (leading up to harvest). This is for a kids’ resource. But I was intrigued to see your pictures and see that you and your wife and siblings are so young. I live in the U.S. in Colorado Springs, Colorado. And it’s fascinating to read about a way of life that’s so different from my own. Thanks for posting this blog so I can learn a bit about modern-day farming. Thanks for reading! It’s always interesting to learn the different ways people live their lives. I hope this blog gave you an honest perspective of modern farming in the North.